Brahmas short story illustration. Charcoal drawing by author. The boy and his father left the truck parked on the side of the gravel road at the top of the levee and walked down from there. They didn’t stick to the dirt road that ran down more gradually. Instead, they walked straight down the side of the levee, carrying the fishing poles and tackle box with them through the thick grass. There were fresh cow plops here and there on the slope, and the grass was tall enough to hide some of them. Before he could answer, the boy tripped over a blackberry bramble and almost went chest-first into a new pie. The boy handed his father the tackle box and took the cane fishing poles in exchange. The boy squinted to see if anything was looking out of the tunnels in the side of the washed-out road, but his father was already walking again. It was difficult for the boy to keep up in the thick grass and brambles. At the bottom of the levee, the boy’s father waited near a clump of grass that was extra healthy and green. In the center of the clump was an armadillo shell bleaching white. The maggots had already taken the carcus to the bones, but the spot still had a sickly sweet smell. When the boy walked up, his father spit tobacco juice on the white shell and said come on. 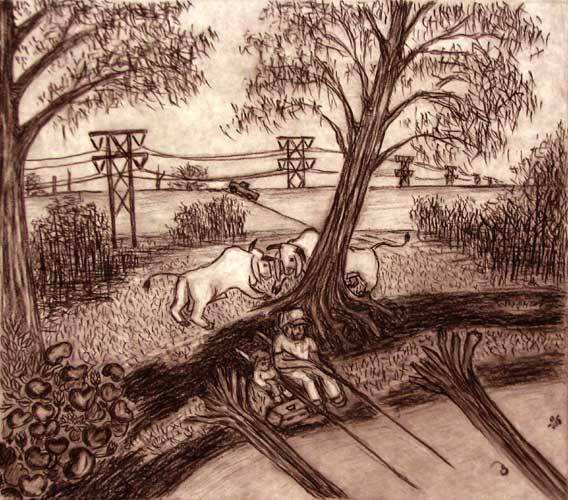 They kept to a cow trail that ran on an earthen causeway through the tall willows. The trail itself was worn to muddy hoof prints, but it was never wider than a cow. On either side was knee-high grass and briars that hung out and snagged clothing. The boy didn’t say anything. Past the willows, the ground on either side rose slightly higher and the causeway ended abruptly. The trail split up into fainter, less-trampled trails that radiated in different directions across the wild pasture land. Here there were thorny locust trees and open savanna and nothing to shade them from the sun. The dragonflies darted in the heat over their heads. The trail they followed seemed to run in the general direction of the river at first, but then it veered back toward the willows and the levee. The trail became too muddy and trampled where the willows started, so his father cut to the side and used his boot to push down what was left of a short barbed-wire fence that was overgrown with blackberry briers. His father stepped off the fence to set down the tackle box so he could help the boy, and the briers and saplings in the fence started bending back up. The boy did not wait for his father to turn around and help him. Instead, he lept onto the fence post where his father had stepped. He made that leap successfully, but then he the wasn’t able to take another without getting the ends of the poles tangled in the brambles that were bending back up. The boy handed both of the fishing poles to his father but didn’t wait for further instuction. Before his father could speak, the boy lept off the fence post in one big stride that didn’t quite take him far enough. The briers snagged him in mid air. One brier tore angry scratches across his side, but a second vine held firm to both his skin and his jeans. The boy leaped again from the intense pain and frustration, and this tore the brier loose, but not before he had snagged himself on the briers yet again. By the time he stopped leaping, the boy’s arms were criss-crossed with bleeding welts, but still he wasn’t free of the briers. One large vine still hung firm to the back of his shirt, tethering him like a dog leash. He couldn’t even turn to get at it without his shirt collar choking him. The boy did’t say anything. The boy still couldn’t answer. He was still smarting and too frustrated to talk without tears coming. The boy took the poles and followed his father down the path. The river was still a half-mile away through the woods, but they weren’t going there. Instead, they left the path at the edge of the woods, and walked under the trees until they came to a small clearing. At the edge of the clearing was a water hole not more than thirty yards across. The water hole was small, but it was relatively deep, like a pit, and the water level had gone down far enough that a fisherman could lean back on the steep bank as he fished and not be visible from either the clearing or the woods on the other side. At the edge of the pit, the boy’s father paused to see the best way down to the water’s edge, weighing the steepness of each route against how muddy it was. At first he couldn’t see anything that didn’t involve the boy stumbling through deep muddy hoof prints, but then he saw on a good place between some fallen timber where the logs had kept the cows from trampling the mud up so badly. They placed the tackle box and other gear on the edge of the small bluff and scrambled down the side. Then the boy’s father reached up and pulled things down, handing them to the boy one at a time. Once at the waterside, they worked frantically getting the poles unrolled and baited as fast as they could. The boy was just as excited as his father because the day wasn’t too hot yet, and it looked like the fish might be biting. They had barely time to get their lines in the water before they were pulling out fish, and what they caught weren’t the smaller bream and sunfish the boy had expected. Now the boy knew why they had brought a heavy bucket of minnows instead of crickets. The fish they caught were full-grown croppy, fish that would be expected in the open water of the larger lakes, but not in a pond this small. It made the boy wonder if the small round pond might really be a deep pit, maybe one that was connected to the river, at least by seep water. The boy spent most of his time netting minnows out of the bucket while his father worked the poles. The fish were coming in so fast that the boy and his father didn’t bother sitting down, but then the sun started blowing in and out of the clouds, and that seemed to spook the fish for a while. In the lull, the boy and his father leaned against the steep bank and got relaxed. His father opened a beer, and they watched a hawk circling around silently overhead. Then suddenly the water and mud splashed all over them. Two snorting, kicking bulls had leaped over their heads from the bank above and directly into the water in front of them. In the scramble back up the steep bank, the two bulls were still trying to spar with their horns locked together. They paid no attention to the boy or his father because they did not see the boy or his father. The boy felt his father jerking him up by the back of his collar. The boy was scarcely up out his seat before a hoof had stomped a six-inch crater in the mud where his head had been. The boy’s father had one of the cane fishing poles in his other hand and was beating the backs of the bulls as fast and as hard as he could. He was practically shoving the closest bull sideways up the side of the bank. The bull’s hooves shot out trying to connect with his father’s legs or the ground or anything else that he could kick or push against. The bulls were back up on top of the bluff in a matter of seconds, but the boy’s father had swung up after them and was still beating them as they leapt away into the clearing. The fishing pole was cracked and broken, and it came to pieces in his hand, but he barely seemed to notice. The boy’s father was past rational thought. In the adrenaline burst of the emergency, the boy’s father had made a crazy decision, the only one that could have worked, but one that never would have been considered had there been time enough for actual thought. He had charged the bulls, screaming and furious and armed only with a cane fishing pole, whipping them like a mad man, giving every indication that he would kill them both with his bare hands if necessary. After the bulls had moved on, the boy followed his father up to the top of the bank, and only then did he see exactly what had run over them. It was two brahma bulls, pure white with black horns and hooves and in perfect lean health, probably two years old or so, in rut and fighting like mad. The white bulls couldn’t be any more tropical or mysterious looking, and for a moment it seemed like dinosaurs or mammoths or some other extinct mega fauna might just as easily come bursting through the trees. After the bulls were gone, the boy’s father was angry and ready to go home, but the boy didn’t want to leave. He was still fascinated by the strange deep water of the bar pit and how many croppy they could catch there, but he didn’t say anything. It was never a good idea to question his father when he had made a decision, and besides he was right. With all the other water holes drying out, the bulls would definitely come back to the pit at some point, and they would probably still be sparing and chasing each other without paying too much attention to where they were stepping. On the drive back to the house, the boy’s father drank his beers in silence like he always did. He took the long way back, driving the gravel road on the crest of the levee all the way to Lake Lee. The boy was a little hurt and disappointed by the instruction, but he said yessir and left it at that. Did his father really think he needed reminding of something so basic? It made him wonder how much competence he had in his father’s eyes. Suddenly all he could see was the scene of his shirt snagged on the brambles beside the trail, and his face and neck tingled with embarrassment. The boy decided that if he did see a turtle crossing the road, he wouldn’t even ask to stop and get it. He decided that from now on he would try to act more like the man his father wanted him to be. He started making a mental list of all the things he would do and not do but had trouble keeping focus. The hum of the gravel road made his eyelids heavy. He let his mind drift back to the cool deep water of the pit, and within minutes he was asleep.